didnt get the ending it desrved. 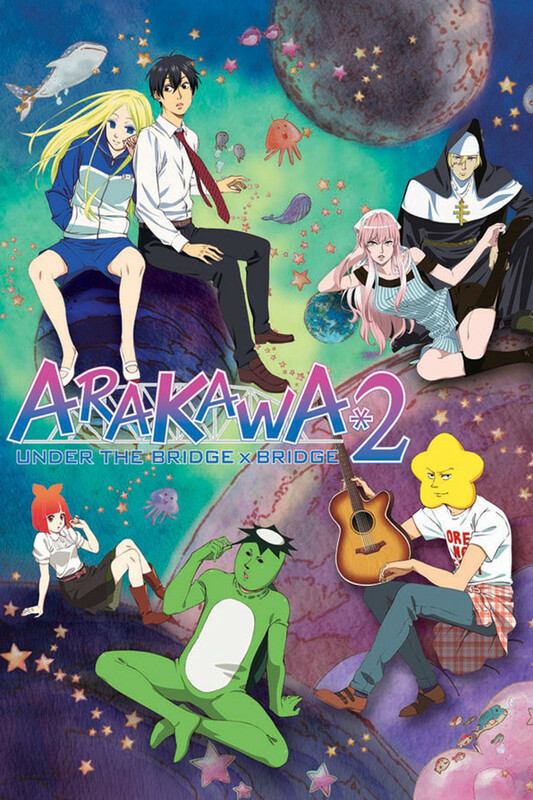 Arakawa Under the Bridge is not an ordinary show. It’s one that attempts to subvert the myths and biases of modern society, and has an overarching theme of accepting differences. I would definitely recommend watching this. Our main character, Rec, is someone who has it all- wealth, fame, intelligence, wit. However, he both figuratively and literally falls from his place of glory. When we first meet the cast of this show, we assume they are all bizarre and delusional. Although this is true, the show points immediately at the “depth” of the human mind. Why do people act the way we do? Why do we berate them for it? At the end of the day, as we start to delve deeper into their psychology and learn more about them, we realize that perhaps we are the ones that are odd for judging them, as what some people consider “common sense”, is, as the show puts it, “not so common”- all is just a collection of biases and assumptions that we have. When other people live, behave, and believe differently, we objectify this as “wrong” or crazy. The more Rec embraces who he is and not what he is “worth”, the more he starts to fit in. This show’s biggest strength by far is its characters. Obviously we have Rec. He starts off, as I like to put it, likably unlikable. We see how his strict upbringing has built a wall of beliefs and assumptions which all fall to pieces under the bridge. However, he is incredibly dynamic. With every episode, he is noticably less arrogant and starts to fit in more and more. Then we have Nino. Her personality is spectacular. She is selfless, enigmatic, and blunt. This contrast with Rec really makes for an interesting dynamic. She is the one who’s mystery moves the plot forward the most. Sister, Hoshi, the Village Chief, Maria, and even P-ko are some of the most likable and fascinating characters I have seen. Even the twins are endearing and have a hilarious skit or two associated with them. The Last Samurai is a man of culture. The story, the social commentary, the intro (S1 is especially catchy), and the art style are all top of the line. We need more shows like this. Ones that not only subvert expectations and have a point, but also have fun doing so and make you feel a broad spectrum of emotions. My only complaint is Season 2 does not live up to Season 1 and loses direction, but that’s just my opinion. Also, S1 has more of a proper and fully satisfying conclusion opposed to S2’s random stuff. But the music for S2 is good and it is still enjoyable overall. This is one of the few shows on here that when you search by genre and check the box for comedy, it's actually laugh out loud funny. I'm so glad they did a second season! The art reminds of the monogatari series. It's funny with rarely any romance in it. The relationship between Kou (Recruit) and Nino is more of one comforts the other or one watches the other. The characters are odd, but they're odd in a good way. Sister and Maria seems like the comedic type of couple due to Maria's insults to Sister which causes his war scar to open and leak out blood. The opening and ending are quite different to each other. The opening was up-beat than the ending, but they're both fun to listen to. Maria's opening gives a jazzy theme while insulting Sister. Piko is cute, but her love interest to Chief was very surprisingly. I'm very glad that I came across this hidden gem. Fell in love from first episode and it keeps getting better. Great characters, character development, story line, and an abundance of comedy to keep you hooked and entertained. Some parts are hilarious, and some parts catch you right on the feels. This show is quite amazing through and through. There's not a single episode I saw that I didn't like or laugh out loud, It's 95% comedy, 3% romance, 1% fighting, 1% mystery. I challenge anyone to watch one episode and not enjoy it, otherwise you don't know what's funny. I'm they type that doesn't watch shojo anime and romance too often. I originally looked for this because I was looking for more comedy anime. But it's a romantic, sci-fi, comedy, slice of life anime....if I had to give it categories, but really, it's just awesome. You've got a silver spoon heir to a fortune 500 company stranded on a bridge whose pants were stole by a group of mean looking middle schoolers. And that's where we start, that hooked me from the beginning. But over the course or the 12 episodes, you get to know the colorful, weird and heartwarming characters under the bridge. The romance part isn't heavy and doesn't overshadow the comedy at all, in fact, it's a large part of it. You have two very different people getting to know each other slowly and with all the misunderstandings that follow. I find that in a lot of romance anime its way over the top and even though it's anime you want to think...."think might remotely happen if these were real people." Which most romance anime, that thought is blown out the window during the first or second episode. But I love all of the characters )Sister and Maria's relationship is the favorite of mine) and really, due to the comedy, even Hoshi, who is a douche the entire time, become lovable in his misery. This comedy romance is really well done! Most of the jokes rely on facial expressions due to reactions and also a bit of satire very happy to have found and makes me real proud to be a premium member of the CrunchyRoll Community!